(CNN) -- Tiger Woods says he is close to making his eagerly-awaited comeback to competitive golf but will put his family first as he decides his schedule for the rest of the season. Woods has set his sights on April's U.S. Masters in Augusta as he goes in search of a 15th major. The world number one has not played since winning his 14th major title at last June's U.S. Open, playing all four rounds in agony with a ruptured cruciate ligament in his left knee and a double stress fracture of the lower leg. The world's richest sportsman had reconstructive knee surgery following his playoff victory over Rocco Mediate at Torrey Pines and ruled himself out for the remainder of the 2008 season. Woods has been rumored to be making his comeback to the PGA Tour in the near future but he told his personal Web site that it was by no means certain he will throw himself into a full-time program. "Once I come back, I'm not sure how much I will play," Woods said. "The perfect scenario is I come back without a hitch and play a full schedule." He added: "At this point, especially with the baby coming, I'm taking it tournament-to-tournament. With our new addition, it's going to be a hectic spring." Woods and his wife Elin are expecting their second child later this month. They already have a 19th-month old daughter Sam. "A lot depends on the baby, which is due pretty soon," Woods added in his monthly newsletter. "That takes precedent over anything I do golf-wise." Personal issues aside, Woods appears to be delighted with his progress since taking his first full swings with a golf club back in December. "I did some work with Hank Haney for a few days last week and it's all good," Woods revealed. Can Tiger recover his bite? "I'm full-bore with my practice sessions and have no restrictions; it's just a matter of getting my golf endurance up. I don't have my golf stamina back yet." Woods will be aiming to be fully prepared for the first major of the season, the U.S. Masters in Augusta at the start of April where he will bid to win his 15th major in pursuit of the all-time record of 18 by the great Jack Nicklaus. Ireland's Padraig Harrington won the final two majors of last season in his absence, but many feel it needs the return of a fully-fit Woods to rescue golf from the effects of the global economic downturn, with many PGA Tour sponsors feeling the pinch in the United States. 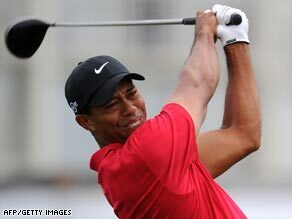 In an ominous message to his rivals, Woods said he had never felt better after the surgery and could now swing unhindered. "I'm doing all the things I've been trying to do for a long time but I can actually hit into my left leg without my bones moving. It's a nice feeling! It is so much better than it ever has been because my bones aren't grinding against each other." Do you think Woods will quickly return to the top of golf's leaderboard?